This is a fun, easy way to let your family know you love them. And it’s a rather easy recipe too. Can’t ask for more, right? Preheat the oven to 350 degrees F. In a medium bowl, cream together butter, peanut butter, 1/2 cup white sugar, and brown sugar until smooth. Beat in egg, then stir in vanilla. Gradually blend in the flour, baking soda and salt. Shape dough into 1 inch balls. Roll in sugar to garnish. Place 2 inches apart on ungreased cookie sheets. Criss-cross with fork tines. Bake at for 10 to 12 minutes in the preheated oven. Cool slightly, and remove from pan. 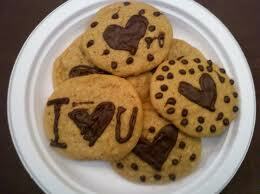 Decorate with melted almond bark (I used chocolate) and write anything you’d like on the cookies. Put the melted chocolate in a small ziploc baggie and snip a little bit off the corner. Then, it’s easy to pipe the chocolate on the cookies. Enjoy! Chocolate goes so well with peanut butter. This is a super idea. These look delicious, what a clever idea! what a great idea! They look delicious!